I am inspired by astronomy and always have been. I remember the first time I looked through a telescope as a kid: we were at summer camp taking turns looking at Saturn, a perfect marriage of icy rings and tiny diamonds for moons. And as a kid I first heard about the Voyager probes, launched thirty-six years ago; Voyager I now traveling in interstellar space; the space between the stars. It takes Voyager I 17 hours for its messages to reach us, sent by radio signal over the 9.5 billion miles it has traveled to this point. Awesome. The Voyager project came from a time when, perhaps, we dreamt a little more and worried about material gain a little less. It was sent by NASA to study the planets of the solar system, but it had a second objective built sideways into the subtext: to leave our solar system as a message in a bottle, possibly received by some other intelligent species on some other side of the vast ocean of stars. 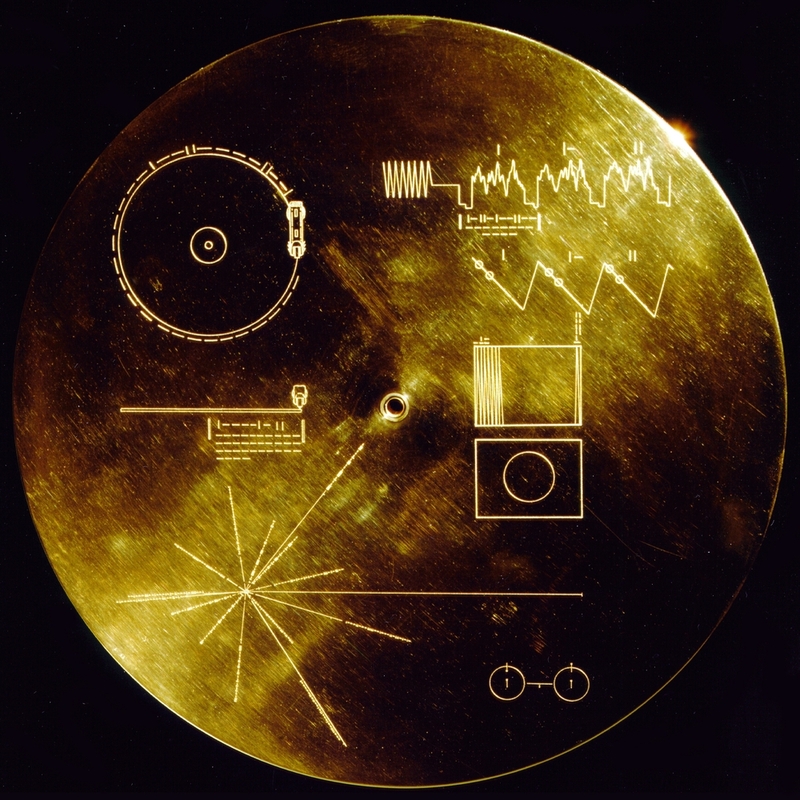 To carry the message, Voyager is equipped with the “Golden Record,” an actual 12-inch gold-plated record that contains pictures and music electronically imbedded on it to describe our lives and history as a species. Amongst the sample images, there are scientific diagrams and photographs of elephants, schoolchildren, and highways. On the audio playlist are greetings to the universe recorded in 55 languages and music–some of the most glorious–by Bach, Berry (Chuck), Mozart, Stravinsky, and last on the album: Beethoven’s shattering Cavatina from his Op. 130 quartet, as recorded by the Budapest String Quartet. The people at NASA and the committee put an extraordinary document together in this Golden Record. In my experience, scientists have some of the deepest and personal connections to art of anyone. "From this distant vantage point, the Earth might not seem of any particular interest. But for us, it’s different. Consider again that dot. That’s here. That’s home. That’s us. On it everyone you love, everyone you know, everyone you ever heard of, every human being who ever was, lived out their lives. The aggregate of our joy and suffering, thousands of confident religions, ideologies, and economic doctrines, every hunter and forager, every hero and coward, every creator and destroyer of civilization, every king and peasant, every young couple in love, every mother and father, hopeful child, inventor and explorer, every teacher of morals, every corrupt politician, every "superstar," every "supreme leader," every saint and sinner in the history of our species lived there – on a mote of dust suspended in a sunbeam." I’ve been watching the reboot of the TV show Cosmos, first hosted by Sagan and now hosted by Niel deGrasse Tyson, who is also brilliant. On the show, Tyson mentioned that it will take Voyager eighty-thousand years to get to the next star over from our own. I like to fantasize about what that first encounter with Voyager will look like in eighty thousand, or eight hundred thousand, or eight million years from now. After so many millennia of lonely sojourn, I imagine intelligent life forms probing the probe, looking for the “on” button, debating with each other what it means and who we were? Is it a threat? A lost device? Or, most unlikely but true, a friendly introduction, a missive sent into infinity hoping to meet anyone at all that crossed its path. And what would that Cavatina sound like after all those years? Would it be warped and modulated, so distant in time and space from its source? And perhaps the aliens would learn what they needed to about us from Voyager and decide to send it back out into space, keeping its role as the most ancient and modern time capsule our civilization has ever assembled. Voyager could continue in the expanse to meet another civilization, as alien to them as they are to us, with a snapshot of ourselves at our most human, living on this pale blue dot. Those thoughts and images are the inspiration for my new string quartet. Pale Blue Dot was commissioned by the Caramoor International Music Festival, on behalf of the Dover Quartet, for A String Quartet Library for the 21st Century. World Premiere: July 11, 2014 at Caramoor Center for Music and the Arts.